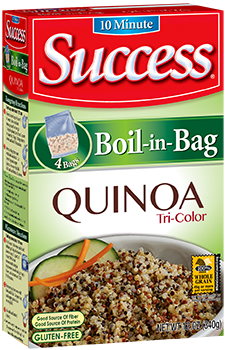 HOUSTON (March 13, 2017) — Riviana Foods Inc., America’s leading rice company, announced today the launch of Success® Tri-Color 100 percent Quinoa, which is packaged in the same boil-in-bag as the other products in the Success product line. This Success product is an easy-to-prepare, quick cooking quinoa and offers consumers a protein-rich option that can be served as a mealtime mainstay or integrated into a variety of recipes. Quinoa is a traditional ancient grain known as “The Gold of the Incas.” The blend of white, red and black quinoa from Peru cooks up light and fluffy and has a nutty flavor. Success Quinoa is a quick and easy product that cooks in only 10 minutes and is packaged in pre-portioned, BPA free boil-in-bags, so there’s no measure and no mess. This versatile product is also gluten free, 100 percent whole grain, a good source of fiber and a complete protein, containing all nine essential amino acids. Chefs at Riviana’s test kitchen developed an assortment of recipes showcasing inventive and deliciously satisfying ways to incorporate the new Success Quinoa into different meal occasions. For example, boost the flavor of this versatile grain by cooking the boil-in-bag in fruit juice, broth or milk to create sweet, savory and nutritious dishes the whole family will enjoy. It’s also a great staple to prepare at the start of the week that’s easy to integrate into salads, soups, puddings and side dishes. There’s a variety of Success Quinoa recipes to satisfy consumers’ appetites at any time of the day. 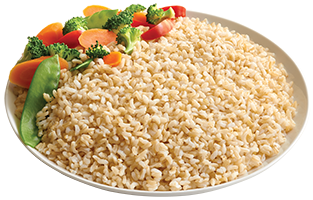 The Success product line also includes Whole Grain Brown Rice, White Rice and aromatic rice varieties such as Thai Jasmine and Basmati Rice. Success Quinoa is available in stores nationwide. To learn more about the newest Success product, visit www.successquinoa.com. For additional delicious recipe ideas and more information about other varieties within the Success family of products, go to www.successrice.com. Riviana Foods Inc. is the largest processor, marketer and distributor of branded and private label rice products in the United States and the world’s second largest pasta manufacturer. The Riviana family of well-known brands includes Minute®, Success®, Carolina®, Comet®, Adolphus®, Blue Ribbon®, RiceSelect®, Gourmet House®, Ronzoni®, Creamette®, Skinner®, San Giorgio®, Prince®, Catelli®, American Beauty®, No Yolks®, Wacky Mac® and Light & Fluffy®. Headquartered in Houston, Texas, Riviana is a wholly-owned subsidiary of Ebro Foods, S.A., a leading Spanish food company. Join the Success® community online at www.successrice.com. Also, follow @successrice on Facebook, Pinterest, Twitter and Instagram.